Good morning. 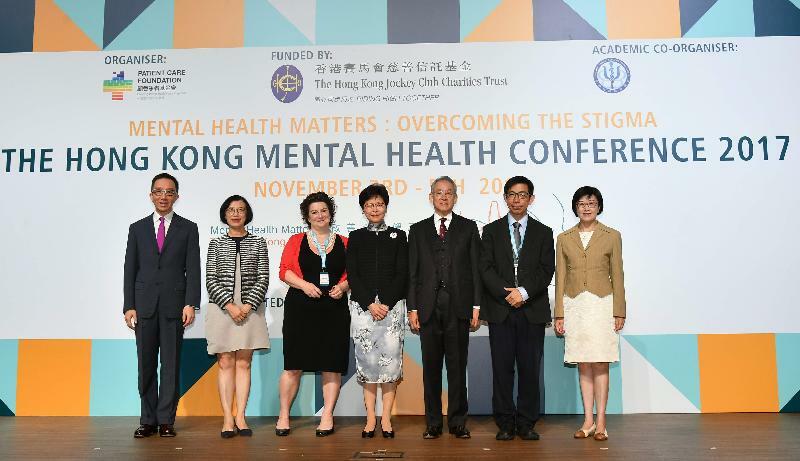 I’m pleased to join you today for the opening ceremony of "Mental Health Matters: the Hong Kong Mental Health Conference". It certainly matters here in Hong Kong, as this three-day international conference makes clear. Over the first two days, multi-disciplinary experts will offer their insights on a great many mental health issues. The final day, open to the general public, will feature a wealth of resources on mental health and wellness. Such resources will help our community better understand and ultimately overcome the stigma of mental illness. Mental health is clearly not just a clinical or policy matter for practitioners and the government. It is emerging as a key social issue that affects a growing number of individuals and their families. But public awareness has to be raised in order to make clinical policy solutions effective. 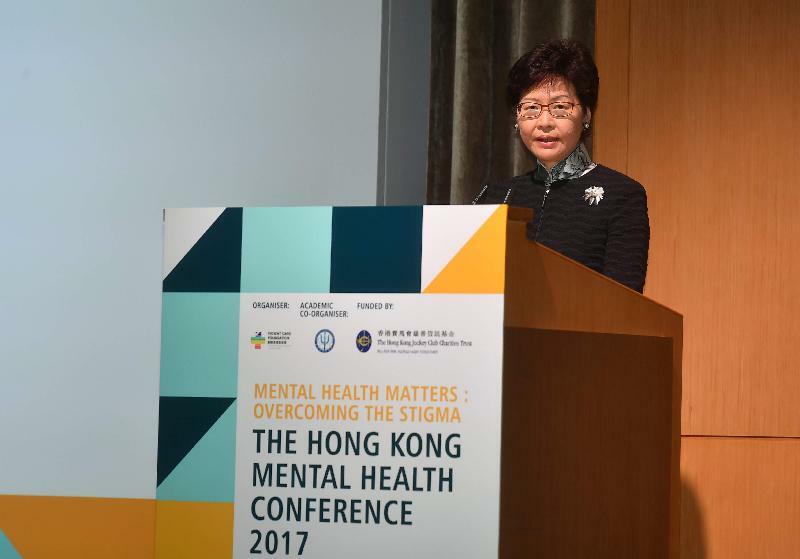 In April this year, the Government completed a comprehensive review of mental health, with a view to mapping out future directions for the development of mental health services in Hong Kong. The resulting Mental Health Review Report put forward 40 recommendations covering mental health needs, support for families and carers and the mental well-being of the general public. (d) to strengthen information systems, evidence and research for mental health. We are now implementing many of the Review Report’s recommendations, and an Advisory Committee on Mental Health will be set up shortly to provide continuous steer to measures to be put in place. The Committee includes all relevant stakeholders: the healthcare, social service and educational sectors, former service users, and patient and carer advocacy groups, as well as lay persons with a particular interest in mental health. The Committee will advise the Government on mental health services and assist us in following up on other recommendations of the Review Report. It will also work to ensure that our mental health services meet the needs of the community. That includes responding to the challenges of our rapidly aging population. My Government is committed to inclusivity, to ensuring that everyone, young and old alike, gets the support they need. My vision is for us to embrace hope and share happiness. In my first Policy Address delivered last month, I devoted a chapter to Improving People’s Livelihood. In it, I address a wide range of social issues with targeted policies and plans. They include working towards a new Hong Kong Rehabilitation Programme Plan, which covers 10 disabilities, including mental illness. Early next year, a major public engagement exercise will be launched for stakeholders to hold systematic and thorough discussions on the rehabilitation service needs of persons with disabilities. In the meantime, we will continue to expand and improve our rehabilitation services offerings. That includes boosting mental-health support services in the community. In particular, professional support for ex-mentally ill persons and persons suspected to suffer from mental health problems will be strengthened through the provision of individual or group psychological treatment and enhanced clinical supervision of frontline staff. Prevention is better than cure. Promoting mental health should be accorded greater priority within and outside of Government, in schools, families and the workplace. Among others, we have launched a Joyful@School Campaign to enhance students’ resilience, identify and support vulnerable junior secondary students at an early stage, and boost parent and teacher awareness of students’ mental health. We have also launched a dedicated website which contains useful information and tips for students facing stress or other problems in their everyday life. We need all the support we can gather in the promotion of mental health. Therefore, my thanks to the Patient Care Foundation for organising this vitally important conference, and the Jockey Club for its generous support and sponsorship. I wish you all a rewarding conference. I hope, as well, that your discussions help advance the opportunities, and the lives, of all those who have been affected by the stigma of mental illness – here in Hong Kong and all over the world.